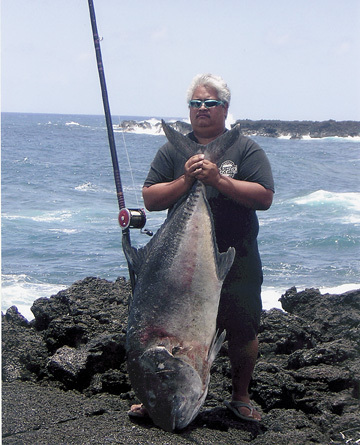 Bill Vierra, Duke Paa'aina and Edward Delos Santos were fishing in the 2005 S. Tokunaga Ulua Challenge on the Big Island of Hawaii when they saw a couple of monster ulua responding to the palu (chum) they'd placed in the ocean. As the big fish ripped into the chum, Bill rigged a pole and hoped for a bite. He got it in the form of an enormous 136-lb ulua that won the tournament and graced the July cover of Hawaii Fishing News.